Because the video is long (19 min) and has a great deal of information, teachers may want to use it in chunks. Dr. Kendrick Taylor of the Desert Research Institute and Chief Scientist for the WAIS Divide Ice Core project narrates the video. He takes viewers on a tour around the camp, discusses the process by which ice cores are drilled and extracted from the ice sheet, and explains the importance of ice cores in the overall understanding of Earth's climate history and current climate change. The greenhouse effect and climate models are discussed within the context of ice core data. At the very beginning of the video, scientist refers to heating of the inside of the vehicle cab as an example of the greenhouse effect. This is an oft-used but not a good analogy for the greenhouse effect. The reason for heating a car is due to lack of convection and the heating due to the greenhouse effect is based on absorption and reemission of Earth's infrared energy by greenhouse gases. Comments from expert scientist: It takes students into the places where the research is conducted. It deals with two of the main tools of climate research: paleoclimate data and climate models. It is interesting without pandering to short attention spans. 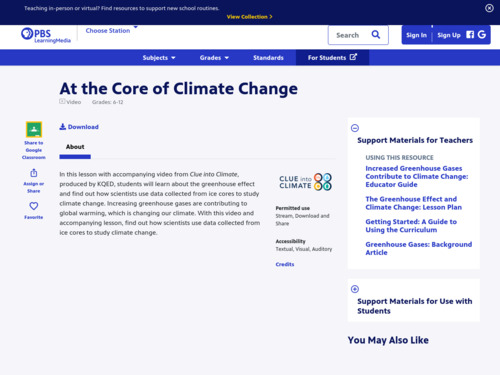 KQED has developed curricula materials to go along with this video, but they are simply watch and answer questions and thus do not represent best pedagogical practice. Nonetheless, these materials are still helpful. The video is full of information that can be used in a variety of ways. For example, the video can be the basis of a flipped lesson with some of the better questions culled from the KQED lesson or new ones written by the teacher.